Click here and here to find lists of common root words and prefixes for SAT Term Etymology. Use this link to view the SOTD Reading Questions. Complete these questions in full sentences in your Hum. 1 Notebook. Use this link to study Lit. Terms. Watch the Video Below for help on how to create an Adobe Spark Video for your Hero's Journey Project! Watch the video below for help on how to create an MLA Formatted Paper. Are you wondering what you should write in a Body paragraph? Use this guide below! ​BT: Proclaims the main idea and contains a reason. CM: Your analysis, interpretation, inferences, opinion, explanation, or insight. Watch the Screencast below to learn how to Submit an Essay on Turnitin. 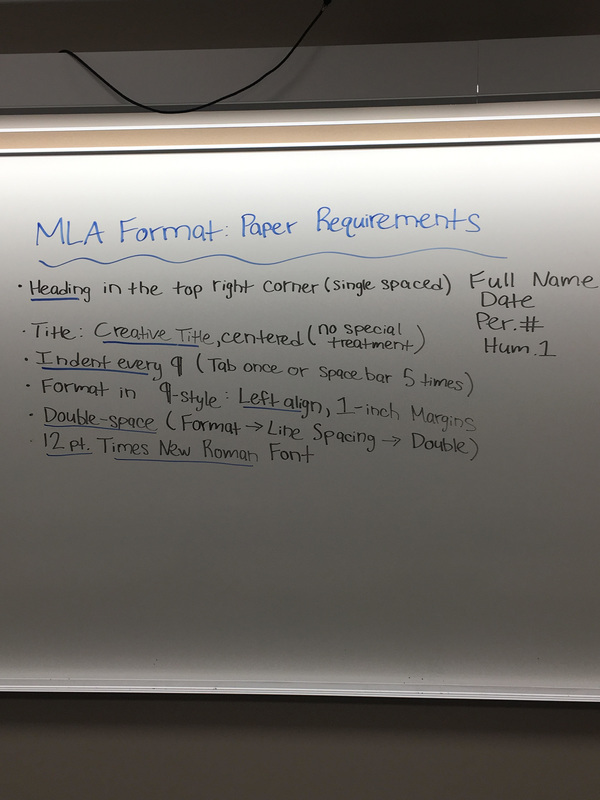 See the picture below for MLA Formatting Requirements for all Essays and Formal Writing Pieces.